Well, I have succumbed to the pressure – again. After all those rants and raves about challenges, I simply could not resist joining the 2009 Christmas Reading Challenge. In my defense, it is not a stressful challenge at all (I can read as few as ONE book during the challenge time period); it is definitely what I am in the mood to read (my number one reason for reading and therefore greatest nemesis to completing challenges); and I have already accomplished the minimum requirement. It really was a no-brainer decision to join. 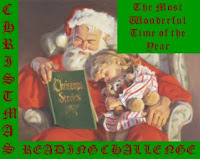 This festive challenge is being hosted by Michelle of the True Book Addict. It runs from November 26, 2009 (the day after Thanksgiving) through December 31, 2009 (New Year’s Eve). Michelle understands all the other commitments we have during this time of year, so the requirements are quite manageable: read 1-3 Christmas themed books during this six week period. She requests that no Children’s books be included in our final count, although YA novels are fine. Well, I have already read A Dog Named Christmas by Greg Kincaid, and I should finish The Christmas Cookie Club by Ann Pearlman this evening. While it is technically a children’s book, I also hope to read A Child’s Christmas in Wales by Dylan Thomas and perhaps — if time allows — the Autobiography of Santa Claus by Jeff Guinn. Are any of you participating in this or other end-of-year festive reading challenges? Isn’t it fun to combine our literary selections with the calendar’s seasonal events? Good luck with your Christmas Book Challenge, Molly. Your list looks terrific, especially the Dylan Thomas one. I joined the Holiday Reading Challenge which has been enjoyable too. I'm doing a holiday reading challenge too. Why not add to the chaos of the season is my motto! Good luck! We didn't get in on this challenge – but I have gotten quite a few Christmas books read. I just can't resist them when they come into the library.